Beirut — Algerian authorities should allow Algerians to assemble peacefully and refrain from using excessive force against demonstrators opposing a fifth term for President Abdelaziz Bouteflika, Human Rights Watch said today. During huge demonstrations on March 1, 2019, security forces used teargas to disperse the crowd approaching the office of the president. In previous demonstrations that began on February 22, Algerian authorities arbitrarily arrested demonstrators and journalists. Authorities have also refused to authorize meetings of a protest movement opposing a fifth term. The presidential election is scheduled for April 18. Algerian authorities should respect the right to free assembly and all other rights that are prerequisites for free and fair elections. "Algerians should be allowed to express their views on a fifth term for the president without fear of being roughed up and arrested," said Sarah Leah Whitson, Middle East and North Africa director at Human Rights Watch. Thousands of Algerians have taken to the streets since February 22 in various cities to oppose a new term for their ailing president, who has been in office since 1999. Bouteflika announced his candidacy on February 10 in a written message. He has not given a public speech since suffering a stroke in 2013 and has rarely appeared in public. Authorities are prosecuting at least 40 protesters arrested in Algiers on February 22, on the charge of "disturbing public order," one of their lawyers, Abdelghani Badi, told Human Rights Watch. Their trial is scheduled for March 3. 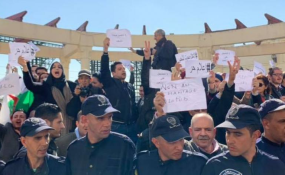 The police also arrested at least 20 activists from the Mouwatana (Citizenship) movement, on February 24 as they tried to join a demonstration on Didouche Mourad Avenue and Audin Square, in downtown Algiers. The group, which opposes a fifth term for Bouteflika, was founded in 2018 to press for democratic reform. Two members of the movement said that the police detained them for several hours. Four other activists, including the deputy president of an Algerian League for the Defense of Human Rights and the president of an association called Youth Action Rally, were detained on February 25 for nine hours after they tried to observe a student protest. Khaled Drareni, correspondent of TV5 Monde and Europe 1 radio in Algeria, told Human Rights Watch that at around 11:30 a.m. on February 28, he saw the police disperse a group of dozens of journalists who gathered in Press Freedom Square in Algiers to denounce media censorship. The police arrested about 15 of them, Drareni said. They were all released around 4 p.m. that day, news reports said. A Mouwatana activist, Habib Brahmia, told Human Rights Watch that the movement had called for a protest on February 24 in downtown Algiers. He said he arrived at Place Audin at around noon and saw hundreds of protesters, surrounded by police. He said the protesters were peaceful, waving Algerian flags and chanting slogans against "the farce of the fifth mandate." He said he saw police in civilian clothes fire teargas into the crowd to disperse the protesters. "One policeman approached me, grabbed my arm and tried to pry the flag out of my hand," he said. "When I resisted, many other policemen surrounded me and hustled me into a police van, twisting my arm to push me inside." He said that the van contained about 20 other activists and Mouwatana supporters. Police moved members of the group from one police station to another until the evening. "Agents interrogated me extensively about my political affiliation, my educational background, and my family. The police also took our fingerprints and photos. They treated us as criminals, but I was just peacefully protesting." Brahmia said at no point did the authorities inform him about the reasons for his arrest. They released him the following day, without telling him whether he was charged with an offense. Abdelwahab Farsaoui, president of the association Youth Action Rally (Rassemblement Action Jeunesse, RAJ) told Human Rights Watch that on February 25, he went to the downtown campus of the University of Algiers to monitor a student protest. He said he was accompanied by Said Salhi, deputy head of the Algerian League for the Defense of Human Rights, and two other activists from RAJ. Farsaoui said that when he arrived, at around 11 a.m., he found hundreds of police blocking the entrance of the university. Inside students were chanting slogans against Bouteflika's fifth mandate. He said police in uniform approached his group, checked their identity cards, and then told them to get into a police van. In the van, the police confiscated the group's phones and took them to the Rue Cavaignac police station. "We were neither interrogated nor given any reason for the arrest," he said. "We stayed there from 12 to 8 p.m. Authorities released us after we signed a police report stating that we had not called for the student protests." The authorities also have blocked meetings planned by the Mouwatana movement. Sofiane Djilali, president of the Jil Jadid (New Generation) party and one of the founders of Mouwatana, told Human Rights Watch that the last public meeting of the group the authorities authorized was on March 12, 2018. Since then, authorities have refused to provide the required authorization that Mouwatana needs to hold meetings or gatherings in public spaces. Algeria's law governing public meetings and demonstrations requires any group planning public gatherings, even inside enclosed public spaces, to seek authorization from the governor three days in advance. He said that the authorities turned down requests for an October 13 meeting in a conference room in the city of Zeralda and another for January 2019, in a hotel conference room in Hussein Dey. "We waited for weeks but the authorization never came," she said. We went to the wilaya [provincial administration] to request a written refusal order, but they refused to issue any document. We had to cancel these meetings." "It is essential for the Algerian police to abide by a strict respect for the rights of peaceful demonstrators," Whitson said. "The Algerian authorities should handle the mass protests in a restrained manner, avoid using unnecessary force and making arbitrary arrests."